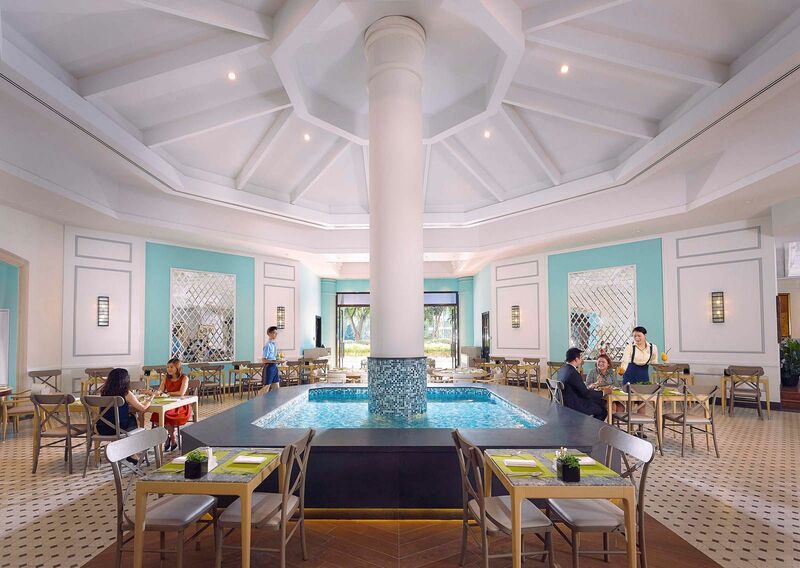 Ellenborough Market Café highlights Peranakan cuisine at its daily buffet. Rich and spicy, the marriage of Chinese ingredients with Malay spices makes meals most memorable. Favourites include ayam buah keluak (tender chicken pieces cooked with the cured seeds of the kepayang fruit) and babi pongteh (stewed pork). The combination of slipper lobster with black bean sauce provides pleasantly sweet and sharp flavours. Mee siam (fried vermicelli in spicy gravy) is recommended for the uplifting zing in the gravy, assembled by a friendly chef at the display counter. Colourful desserts are led by the crowd-pleasing durian pengat, with the aroma of the “king of fruits” calmed by coconut milk, resulting in a thick, creamy texture with sweet and bitter tastes. The compact wine list is adequate. Staff do their best in the busy restaurant by the Singapore River, with a fish pond in the centre of the octagonal-shaped main dining area. The casual yet elegant setting makes this an ideal place for business or pleasure; a small à la carte menu is also available.